5 minute pea pesto has everything you love about traditional pesto but is slightly sweet and so easy to make! This healthy recipe is vegan, dairy free, gluten free, and the perfect addition to any meal! This pesto is the perfect topping for chicken, salmon, pasta, zucchini noodles, roasted veggies or chickpeas for a super flavorful meal! I’ve been making this pea pesto for years! The sweet peas add a fantastic sweetness to the pesto which makes it even better than traditional pesto if you ask me! 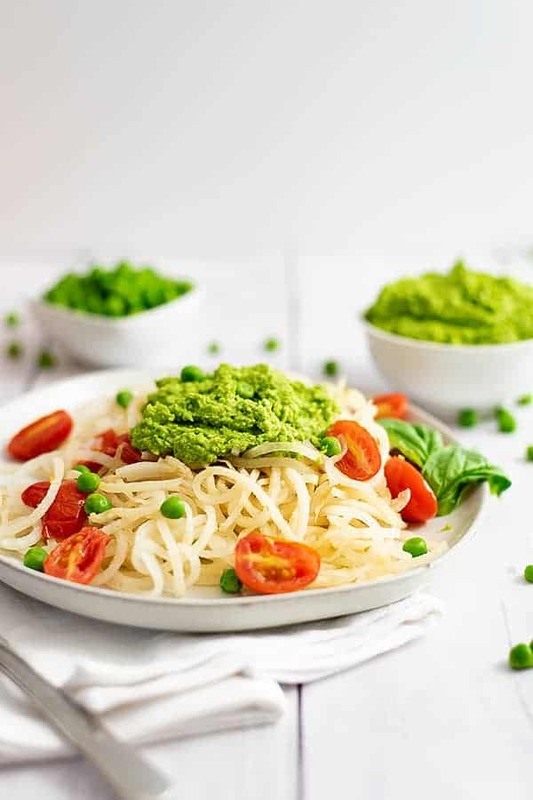 The addition of peas to the pesto also makes this pesto much thicker than traditional pesto recipes! If you prefer a thinner consistency you may have to thin this recipe out with some water. If you do that just be sure to stir it well after storing it in the fridge! And added bonus! 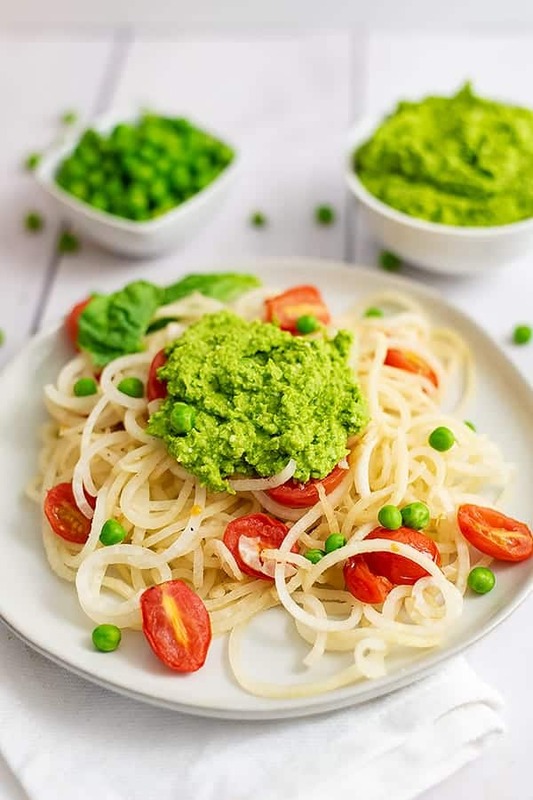 Peas are high in protein and fiber so this pea pesto is super filling as well! In fact each serving of this pesto is about 8 grams of protein! You will also need a food processor to make this recipe in 5 minutes or less! Start by defrosting the peas (in the microwave or on the stove) just until they are tender, they don’t have to be hot. After defrosting, add everything to the food processor and process on high for 2-3 minutes, stopping periodically to scrape down the sides as needed. 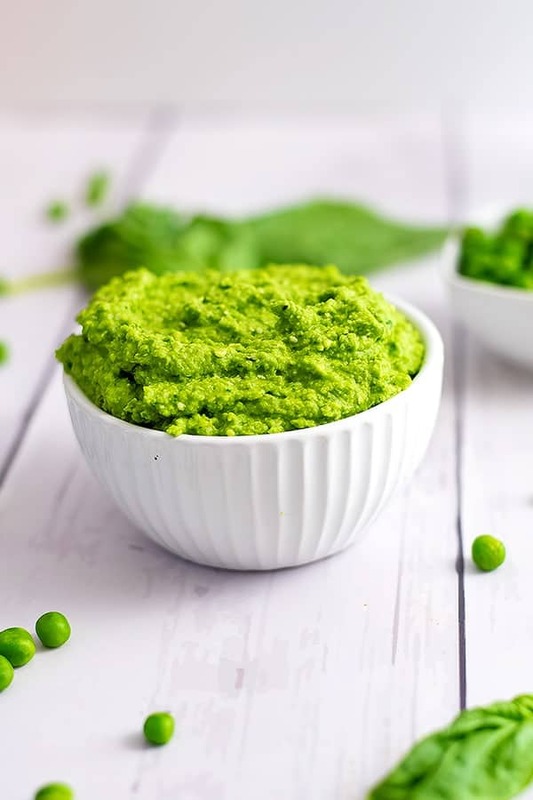 Hemp Hearts: If you do not have hemp hearts on hand (they are packed with protein and healthy Omega-3 fats) you can also use sunflower seeds, pine nuts or even pistachios (shelled) for this pea pesto recipe. If raw garlic is overpowering for you, use roasted garlic olive oil in place of the olive oil in this recipe and leave out the fresh garlic. You can also boil fresh garlic to help take the bitter bite out of it. Refrigerator: This super simple pea pesto recipe can be stored in a covered container for 5-7 days in the fridge. Freezer: Stored in a freezer safe bag, this pea pesto should last 3-4 months in the freezer. TIP: Store the pesto in individual servings (use a ice cube tray or a silicone candy tray) to portion out the pesto into individual servings. Once frozen you can add them all to a freezer bag and use the pesto as needed. Be sure to put a date on the bag for reference! Great to use as a dip for snacking! Place defrosted peas in the food processor (you don't even need to clean it out from making cauliflower rice). Add the basil, lemon juice, olive oil, water, hemp hearts, mince garlic and salt. Puree until smooth (you may need to scrape the sides a few times).